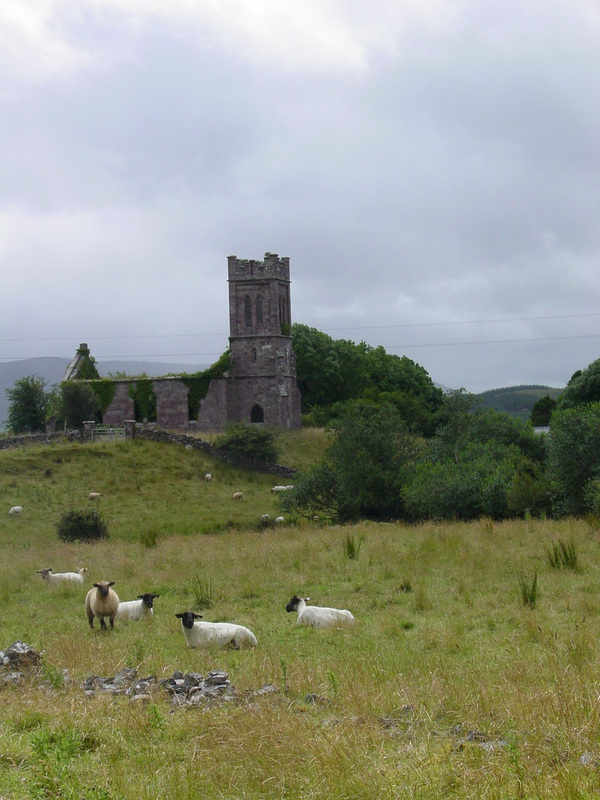 Lost in the sheep pastures of County Mayo in western Ireland, a few miles from Westport near the road to Ballinrobe, is a crumbling old church. Whatever roads once led to it have long yielded to grazing animals and the large grounds and modern homes of two or three affluent families. The roof of the old church has gone. What were once nave and chancel have been invaded by a dense thicket of trees, shrubs and vines. Not even a sign or name for the old building remains. It is probable that this was the church where at least some of the family of James Reed attended, and where some of his children were baptized in the years before the Great Famine devastated Ireland and scattered so many of its people to foreign shores. Top: The old church near Ardygommon townland, County Mayo, where James Reed and Eliza Gibbons may have married. 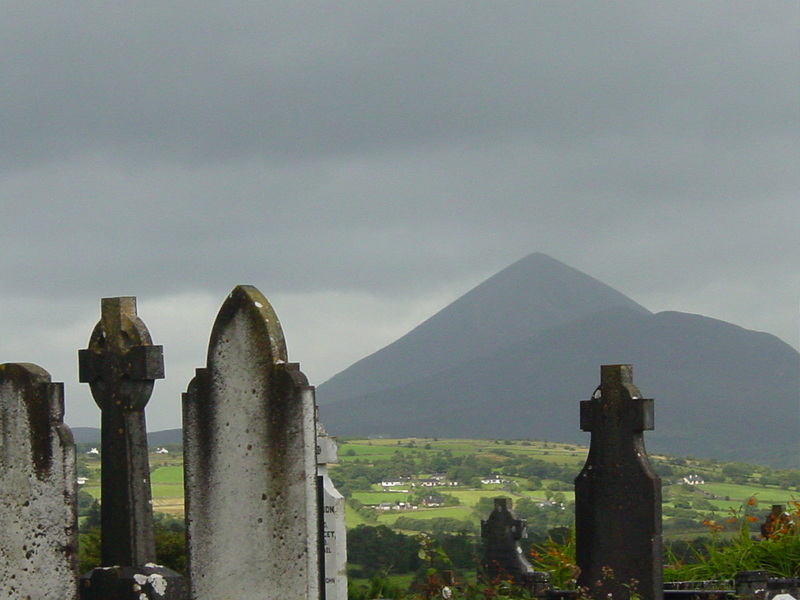 Above: The volcano-like Croagh Patrick, seen from one of Aghagower village's several cemeteries. Left: The marriage entry for James and Eliza in the Oughaval parish register for 1 January 1827. 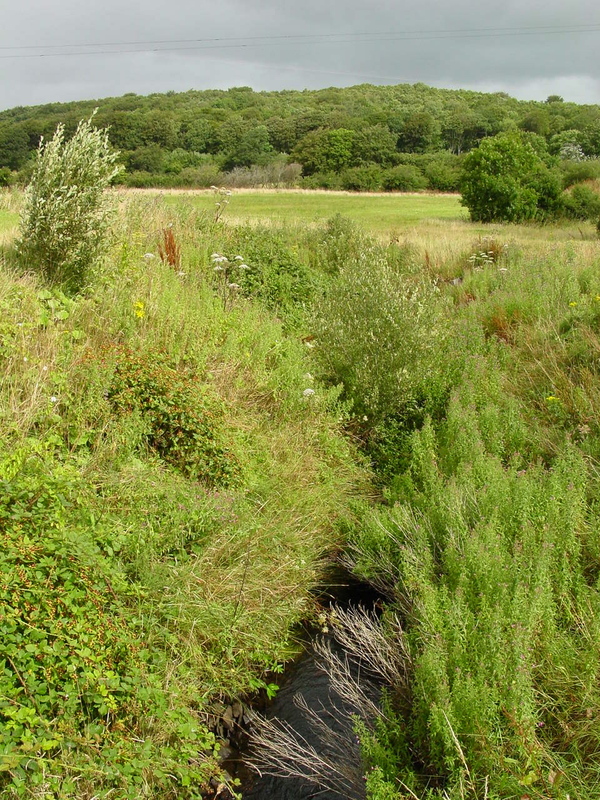 Above: This brook may have marked the boundary for Ardogommon townland. Ardogommon Woods lies beyond. The white house, below, photographed on the same plot in 2009, was occupied by James “Sonny” Gibbons until he died a few years earlier. The exact relationship between him and the Gibbons of the 1800s has not been established. JAMES REED WAS A WEAVER, and lived on the small “townland” known as Ardogommon (sometimes spelled and pronounced Ardygommon). 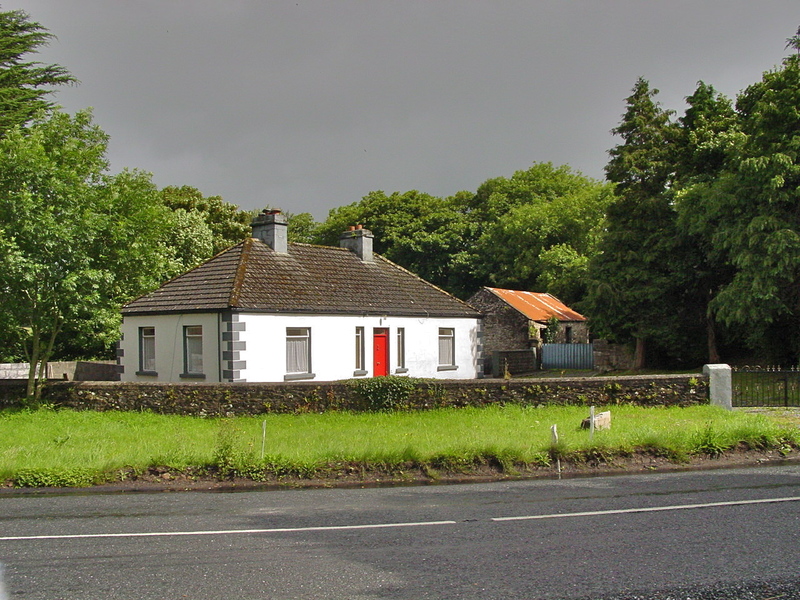 The townland was a 233-acre plot just over two miles from the church, in the direction of Westport on the coast. In Ireland, a townland is essentially the rural equivalent of a street - a parcel of land occupied by perhaps a dozen families, sometimes more, each of which farmed its own plot but often cooperated. Families of that time might have had a specific profession - weaver, blacksmith, cobbler - but all relied for their existence on what they could grow or extract from their own land. Families planted their staple crop, potatoes. They may have had a few sheep, perhaps a goat and a pig. Some dug limestone from the rocky ground to make lime in their own kiln, and cut turf from the bogs to dry and burn in winter. Their fortunes depended on what their land could yield and the unpredictability of the weather. Contemporary parish records show that families by the name of Reed and Gibbons lived in Ardogommon as neighbors in the 1820s. Since people in those days rarely moved far from their rural homes, it’s not surprising that James Reed and Eliza Gibbons married. Records show that the fathers in Reed and Gibbons families living in the same area were weavers - neighbors and probably friends - and it’s possible that a marriage of son and daughter was arranged between them, a common practice of the time. Ardogommon lay close to the boundary of Oughaval and Aghagower parishes, possibly along the boundary itself. The townland itself is only a short distance from Aghagower, a place of great antiquity and historic significance that was the closest village to where the Reeds lived. The village is built around an old ruined abbey that dates to the seventh century AD, with a tall, round tower that now seems significantly off its axis - a kind of rustic equivalent of the Leaning Tower of Pisa. The village breathes antiquity. There is even a large, rough basin-shaped indentation known as St. Patrick’s Vat or Tub, where St. Patrick is said to have baptized Aghagower’s first Christians. The dominant feature of the landscape is the pyramidal mountain known as Croagh Patrick, where St. Patrick is said to have climbed to the summit in the fifth century before a lengthy fast, culminating in his banning all snakes and demons from Ireland. This was the area in which the Reeds raised their large family. Daughter Matilda was born in the spring of 1828, followed by nine more children over the next 20 years. Records show that four of their flock of ten children were baptized in the Church of Ireland’s Oughaval parish. Given their proximity to Aghagower, this again could indicate that the Ardogommon townland straddled the boundary between the two parishes of Oughaval and Aghagower. For the baptism of daughter Sidney in September, 1839, there is a margin note in the register saying “baptized at Ardygommon,” which suggests the church minister traveled to the home for the service. No record has yet been found for the baptism of the other children. Nothing is known of the life of the Reed family during this period, except for the inferences that can be made for most such rural families of that time. Then, in the mid-1840s, came the great scourge which redefined Irish history, accelerated the Irish diaspora and spawned political consequences still felt today. The potato blight that destroyed the staple crop was particularly devastating because the agrarian nature of Irish life offered few alternatives for survival for much of the population. For families living off the land and dependent on what they could grow, there was little or no industry to fall back on. Much of the population had come to rely entirely on the potato. The Great Famine reduced the population of Ireland by between one fifth and one quarter: a million people died, and another million emigrated. 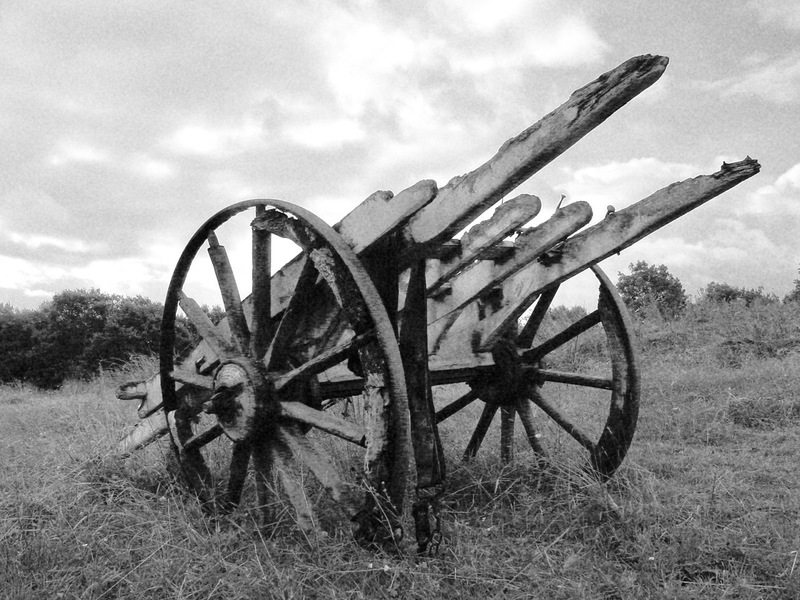 The Reeds abandoned their own plot of land in Ardogommon sometime between the winter of 1848 and the spring of 1851. From Ardogommon the most likely route for the large family would have been by boat from the quay at nearby Westport to Liverpool, the point of departure for thousands of refugees. Or, less likely, they might have gone by rail to Dublin, and then sailed for England from there. Today, memorials to the Great Famine of 1845-1852 stand both at Westport and at Dublin, like bookends on both sides of the country. 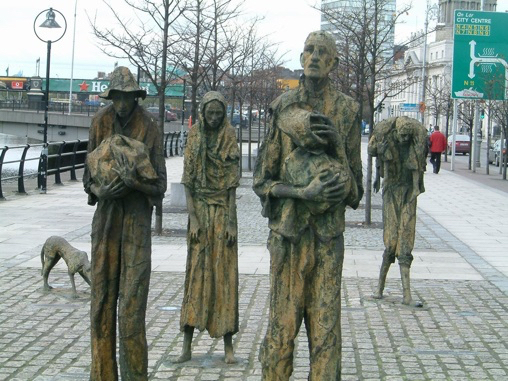 In Dublin (left), an emaciated group of figures stands wretched and downcast. The father is the only one whose eyes are raised, his face a mixture of despair and hope. 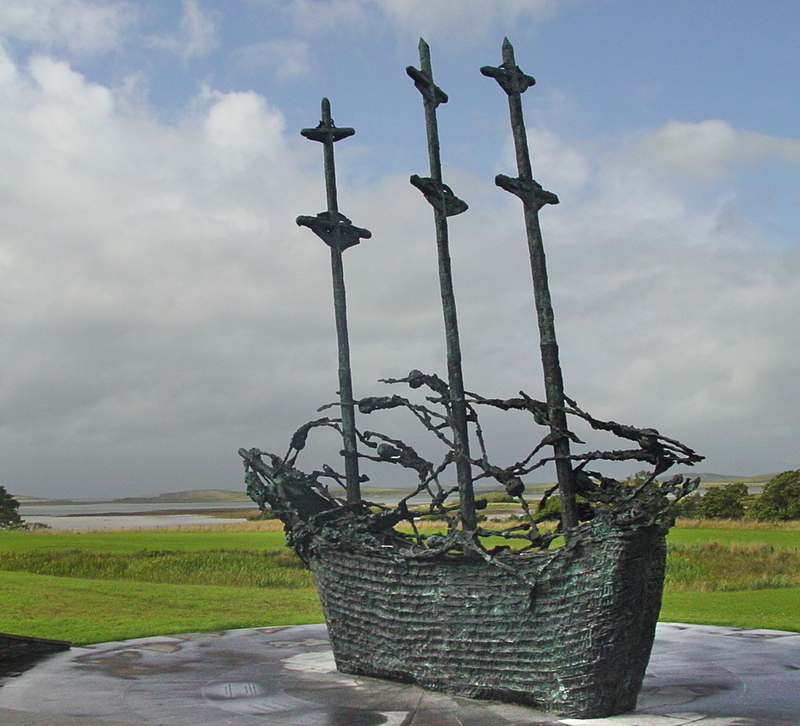 In Westport, John Behan’s sculpture “Coffin Ship” (below) overlooks the Mayo coastline. Skeletal, ghostlike figures flutter over the deck like tattered rigging. This was the environment when the Reeds took their flock of children and abandoned their traditional homeland for the uncertain shores of England, about 1849. Liverpool was a city of contrasts. Trade with the Americas and Africa had boosted it to the largest port in Britain after London. Its enclosed docklands would eventually stretch for seven miles along the Mersey waterfront, and 30,000 dock workers would keep the port humming. But along with those made wealthy by global trade and commerce, conditions in parts of Liverpool were squalid, even appalling for many poor families. 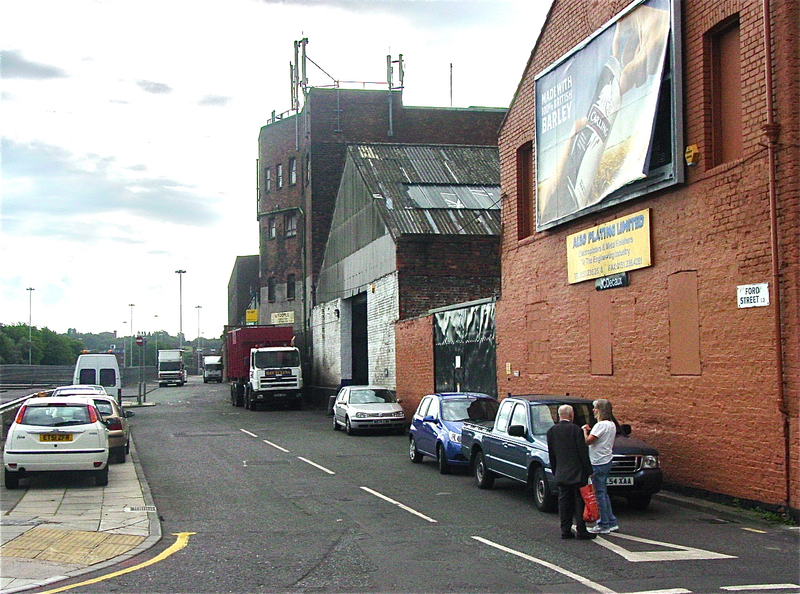 The Reed family found a home in a courtyard enclosure on Ford Street (right), one of many grim blocks of residences along the main arterial roads that skirted the northern dockyards and industry, flanked by the Leeds-Liverpool Canal. Their neighbors were mostly Irish immigrants like themselves - Gallaghers, Malleys, Noons, Boyles and Dunlaveys. Many of the men worked as dock laborers, but there was also the occasional pedlar, along with factory workers and a few professions such as tailors. There was far more opportunity for work than there had been in Ireland, but crowded conditions grew steadily worse over the years, and poverty and disease took their toll. Contemporary writers wrote scathing reports of the conditions in the late 1800s. James and Eliza Reed and their ten children were just one more family among hundreds of thousands of Irish who were seeking refuge through the great English port city in the mid-1800s - but they came to a different world. Compared with the rural life they had known, it must have been disorientating and intimidating. The port of Liverpool was in its commercial heyday. Even the abolition of the slave trade half a century earlier had not significantly impeded Liverpool’s growth. And if life after 1850 changed for the Reeds, the impact of this infusion of thousands of Irish on Liverpool itself was even more profound. The flood of Irish immigrants would literally and permanently remake the city. Settling first around the extensive dock-related industries and inner city, ultimately they transformed the port’s social fabric, its politics, its religious identity and eventually even gave Liverpool its distinctive local accent. For reasons not yet known, James Reed died within a few years of arriving in England, possibly before his 50th birthday. It must have been a struggle for his widow, Eliza, but she made ends meet as a dressmaker and by taking in lodgers. By 1861, income was coming in from Eliza’s children, although exactly how many is unclear. Matilda, the eldest daughter, described herself as a “dealer” on the 1861 census, but after that she disappears from the historical record. Similarly, there is no sign of son, Thomas, or daughter, Margaret, and it’s possible they may have died. William had married Ellen Bourke, an Irish girl whose family may have been known to the Reeds in the old country. William and Ellen’s little son was already a year old when they married, but all of them fit into the Ford Street house. Possibly Eliza watched the child while his mother worked as a general servant. Son David married a few months after William, and moved nearby with his new wife, Mary Barton. In mother Eliza’s home, the remaining children contributed. Even 15-year-old son John worked as a carter. The addition of lodgers must have made the house cramped. The fact that one of the lodgers was a sailor may have eased the pressure a little, but his wife and daughter must still have needed a room of their own. Daughter Sidney was only about eight years old when the family arrived from Ireland. It is her story and those of her descendants that part of this website will follow. In 1870, then in her late 20s, she married Edward Berry. They form the first Berry family in our records about whom anything significant is known. Though they had only two sons who survived to adulthood (one died age 30), their remaining son gave rise to an extensive posterity of Berry families. 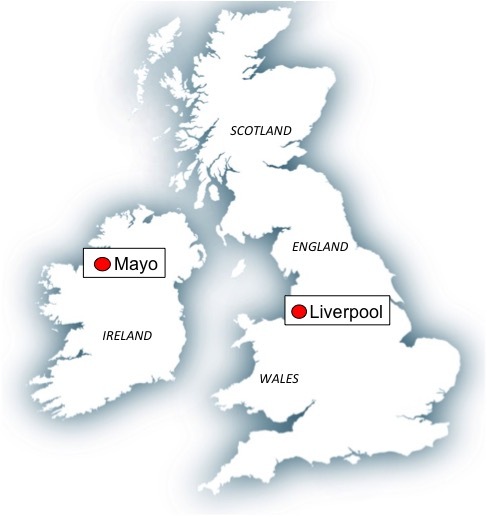 Most remain in the Liverpool area today, while other descendants are found as far away as Australia and the United States. Eliza, the matriarch of the family, who was known as Bessie, lived into her 80s. On the 1881 census she has a 17-year-old granddaughter living with her, and is earning money by using her mangle to wring the water out of clothes for people. Ten years later, she was a boarder in another court-style home, living with an unrelated brother and sister. Even at that age, she earned money as a basket hawker. All her long and hard life, after she arrived in England, Eliza lived in the same neighborhood. Top: Children play in Number 2 Court, Ford Street, Liverpool. This was identical to the block in which the Reed family lived at Number 35 Court in the same street in the mid-to-late 1800s. In the architecture of the courts, “homes” were enclosed on three sides. 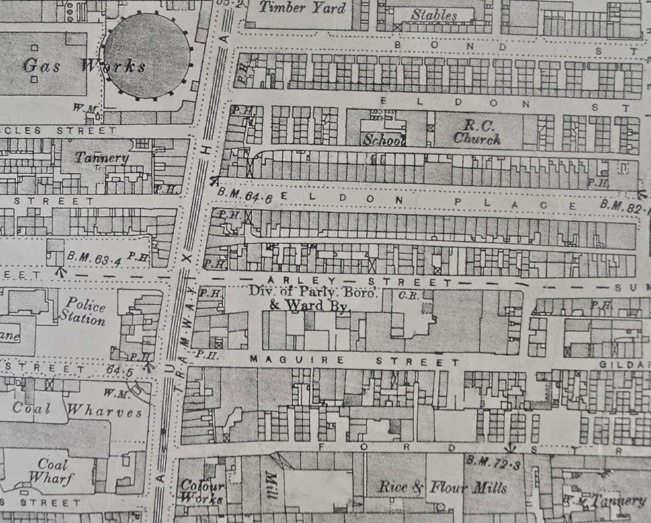 Second from top: Map of the Vauxhall Road area of Liverpool at the end of the 1800s. Vauxhall Road runs from the top to the bottom of the map, on the left. Ford Street runs along the bottom of the picture. 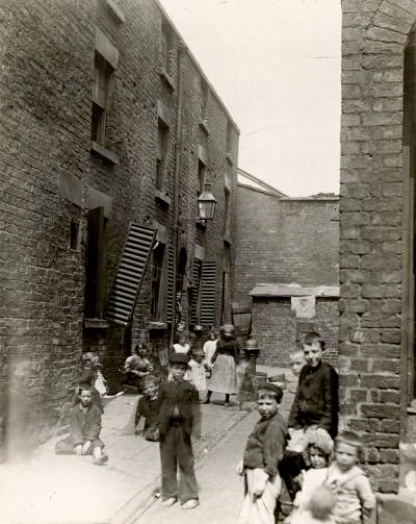 From these streets, men had only a few minutes walk to the gas works, the wharves along the Leeds-Liverpool Canal, the tannery, a timber yard, rice and flour mills and a sugar refinery. Consequently, the names of these streets - Eldon Street, Eldon Place, Vauxhall Road - crop up again and again in the history of several families on this website. Third from top: Changing face of Ford Street. 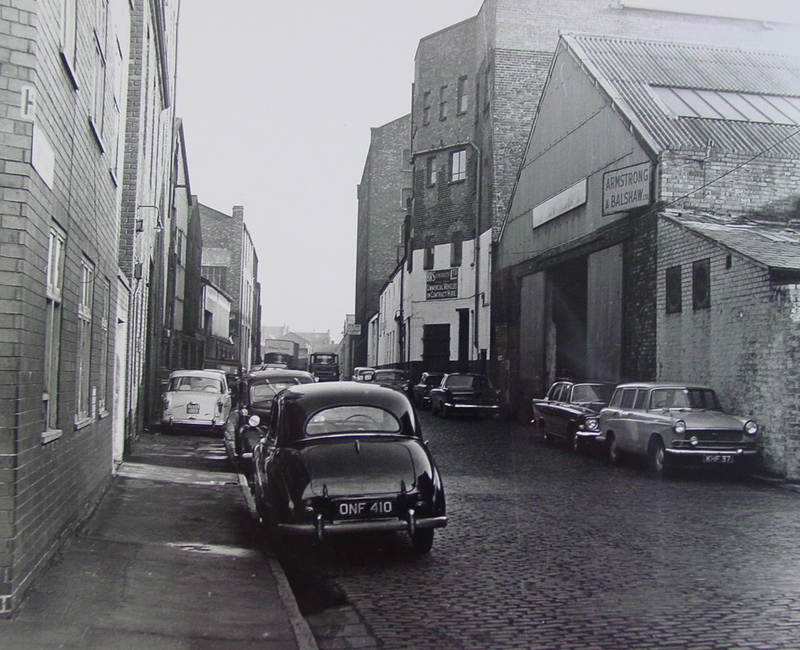 Seen here in 1967 when the old courtyards had been demolished. And, above, again in 2009, now only home to a few commercial premises. However, attractive new housing development has since taken place along Vauxhall Road. Left: Monument in Liverpool to the Great Famine of 1845-1852, in which a million Irish died. The huge influx of Irish into the city during the 19th and 20th centuries earned Liverpool the nickname, "Capital of Ireland." This commemorative pillar sits next to the bombed-out St Luke's church at the top of Bold Street, itself a carefully preserved reminder of World War II.